This tour was not as advertised. We are experienced travelers who have booked through Viator before and been most satisfied. The tour description led us to believe we would learn about the Duoro River valley. Our driver, Carla, provided no information other than a few brief sentences, like there are 4 kinds of port - red, tawny, rose and white: those are grapes for green wine they look different than other grape vines and in my opinion the views between Pinhao and Regua are the best. She told us nothing about the river itself, no tidbits of interesting information. We were not expecting nor did we want a non-stop monologue but we were expecting information with some substance at various parts of the tour. The van was extremely dirty. You could see where windshield wipers had been used - the area cleared by the wipers was covered with bugs and the area outside the wipers' reach was so dirty you couldn't see through it. The side windows for our scenic tour were very dirty also. The air-conditioning in the van was not working properly. It wasn't too bad in the morning as we were driving to the Douro but, after the first wine tasting stop, the three of us in the back seat were sweating profusely. It is really miserable. Comments made by Carla made it clear that the company knew the van was not up to par, especially the air-conditioning. We told her that, if the company knew there was a problem, they should have told us when they picked us up and given us the opportunity to opt out - we would have - we came from Florida and part of our motivation was to get away from the heat! We thought the tour was going to be in English - and it was. But it was also in French as one of the three couples spoke only French. So we had to stand and listen to everything twice. Carla was a good driver. The wine tastings, which Carla was not around for, were fine - one OK and one outstanding. The boat ride was pleasant. But the overall experience was really spoiled by the dirty van, the HOT van, and the lack of interesting information about the Duoro Valley. We definitely did not feel we got our money's worth. Our standard practice is to tip very generously. We did not tip Carla and neither did the other two couples on the same tour. One of the other couples said they had been on previous Douro Valley tours and learned a lot - and felt there were many interesting things Carla could have told us. Thank you for listening. We very much enjoyed our Mallorca walking tour and Porto walking tour through Viator on our same trip. while. We bought a half bottle of vintage port. The scenery is beautiful and we enjoyed the boat trip as well. Great tour, comfortable small bus, good aircon. 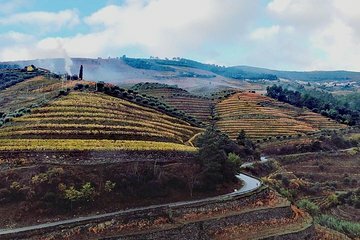 The Douro Valley is astoundingly beautiful and our guide, Miguel, was very knowledgable, obliging, helpful and had a good sense of humour. His English was excellent and he was happy to vary the tour to suit us. The traditional lunch packaged with the tour was excellent, and the tour and tasting at the small family winery was certainly good value, as was the very slick presentation at the extremely well-heeled Sandeman establishment. We also thoroughly enjoyed the short cruise on the river. Everywhere the views are to die for. We are very satisfied with the trip. The wine was good the views beautiful. We took also the river cruise and it was a perfect time.We love our tour guide Tanja who is a nice person and a great driver. For how this tour was advertised and for the price, I would not recommend this tour to anyone. I recommend touring the amazing Duoro Valley to visit port houses and travel on the river but not with this tour company. This tour is more of a driver/drop-off service than an actual tour. Our tour guides were nice but had an incomplete itinerary and provided minimal commentary and insight. At the first port tasting, no one explained the tasting options so we had the one free port glass and left. Then we walked around a local village which is 10 blocks of commercial buildings and had nothing to do. We asked if we should go to the Duoro Valley Museum and they said they didn't know and we would need to pay extra to do that. At lunch, they dropped us off at a restaurant. We did not know what we would be eating. We watched another tour come in with their guide, who stayed with his group, explained the food, and provided more courses/food than what we received. The food was okay it was definitely a local diner sort of place. Considering the price, we were a little surprised. The afternoon cruise and port tasting were great as they were lead by their respective company guides. During both events, our guides waited for us at a different location. We walked to the wrong port house but the correct one was still able to fit us in. When driving home, the driver was using her cell phone for directions while driving a manual. If you've seen the cliffs of the Duoro Valley, you would understand why this is alarming! When it got foggy and rainy she couldn't find the headlights or windshield wipers, saying she had never driven this car before and it can't go above fifth gear without making loud noises. This means our 9 hour excursion took 11 hours. I would not recommend this tour to anyone. We had a wonderful day in the Douro. Our guide Maria was very helpful and attentive. the only negative part of the trip was the first small winery in the town of Peso da Regua. The entire group felt that it wasn't a good experience and not what we were expecting. The second one Symington, however, is exceptional. Amazing. Great attention to detail. Very professional and punctual tour guide Maria. It was the best tour I took in my holiday in Portugal. Must see destination. The whole day is well worth doing and that includes the cruise. Amazing views and the Symington vineyard is amazing. The tour company were very laid back and this can get annoying at times. The lunch was ok. Main course was poor. Although we ended up in the wrong tour there was no farm visit we had a great time. Our guides Tatiana an Geronimo were great. Told us a lot about the valley and life in Portugal. The visit to Symington wine cellar was superb. If you are in the north you have to visit Douro valley. It's very beautiful.